Dozens of previously unseen documents which shed light on the recent controversial private sale of listed former social housing block the Balfron Tower have been posted online by a UCL researcher. As well as forming a comprehensive archive of the architecture, history and living community of the brutalist Docklands building, the cache also raises new questions for Poplar HARCA, the housing association behind the sale deal. The online collection – www.balfrontower.org – has been assembled by David Roberts, a doctoral student in Architectural Design at UCL and member of the art collective Fugitive Images, who has been studying the Balfron Tower for several years. He has made his research public in order to “contribute to an informed public debate on key issues” about the Tower, including its complicated sale. 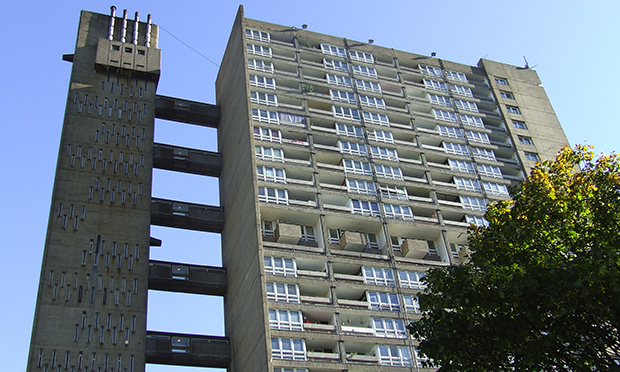 Balfron’s social housing tenants, who previously occupied 99 of its 146 flats, voted to transfer to Poplar HARCA in 2006 on the understanding that their flats would be upgraded to the Decent Homes Standard and they would continue to live in them. They were progressively “decanted” from the block between 2010 and 2015 to allow refurbishment to take place. Following a series of setbacks to the project, it was announcement in February that Balfron would be sold as private flats through a joint-venture with developer LondonNewcastle. The documents on balfrontower.org cover everything from Hungarian-British architect Ernő Goldfinger’s original designs to German-language reviews of the block and the coverage its sale received in the East End Review. Also included is a financial viability document from 2012 which states Poplar HARCA’s intention that the Tower become a “leaseholder only block”, made up exclusively of privately-owned flats. From 2010 Poplar HARCA has maintained it would need to sell some of the block’s flats to pay for refurbishment works, but claimed in public until this year that it did not know exactly how many, insisting, when asked, that there was a possibility – however small – that social tenants might be able to return. Asked about the financial document which suggests this possibility had been ruled out as early as 2012, a Poplar HARCA spokesperson said: “There are significant costs associated with restoring a Grade-II listed building, particularly one in as poor a state of repair as Balfron and the final decision on residents returning could not be taken until the JV [joint venture] was formed in December 2014. David Roberts hopes the site will allow people to explore the subject for themselves. “As a researcher I have the time and access to information that many others don’t,” he says. “The documents I’ve encountered can be intimidating, difficult to access, or difficult to grasp because of bureaucratic, academic or legal language. Roberts’ research focuses on social housing in East London and emphasises first-hand testimony. He began his research project because a Balfron resident got in touch with him. “She was interested in doing an oral history project with her neighbours before they all leave,” Roberts explains. “It is their voices, from inside, that are rarely heard. “As we worked together we met more and more residents that spoke frankly about living in the tower – frustration with unreliable lifts and the lack of sufficient funds for repair, joy at the light and space it offers and an unanticipated spirit of neighbourliness, and anger that these cherished things may soon be lost to them. “One former resident said, ‘On the 23rd floor we felt magnificent. I think for social housing tenants to lose the view is such a terrible theft of experience. You live in the space in a different way. The site is available at www.balfrontower.org.